From the minds behind "Baby Wants Candy," "Thrones! The Musical Parody" and "Fifty Shades! 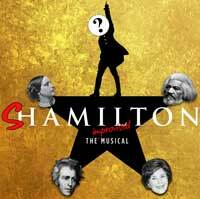 The Musical Parody," "Shamilton" invites audiences to call out any famous historic figure-from Leonardo da Vinci to Genghis Khan to Paris Hilton-and watch an improvised musical unfold in real time before their eyes and ears, complete with gorgeous solos, sweeping chorus numbers and hilarious on-the-fly choreography. The production features a Chicago-based ensemble and a full band, including electronic musical enhancements with looping and percussion.